I've been giving skirts a go the past few weeks. I always find dresses very easy to wear so stick to them, or jeans if I'm feeling lazy. 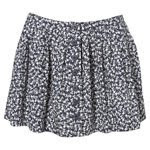 But skirts frighten me a little bit- it means the complications of finding a top to go with it! 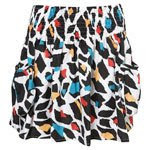 But a couple of months ago I saw this lovely skirt in Dorothy Perkins- black and white check high waisted tulip skirt. I thought 'you will be mine!' and have worn it muchly since. Usually I wear it with a white or black tshirt, thick tights and my black pumps. Casual for every day. Last Wednesday I decided to give wearing a skirt OUT a go. I have this lovely little skating skirt from Topshop with a cat pattern all over it. Cuuuuute. I paid £28 for it which seemed excessive but sometimes something just grabs you and you need to own it! Bought another skirt from H&M for only a tenner. Haven't worn it yet but it is wonderful! Stretchy cotton so very clingy but in an awesome way rather than an ill-fitting way. Black with multi-coloured polka dots and I'm thinking a t shirt with it. I shall be wearing it when I see Glasvegas next week so I will have photos taken to post here. Just been on the Topshop website and they have some lovely new skirts in. I think this one is crazy but I absolutely love it. Love those skirts, espeically the first one! Bet they look wonderful on you! Thanks for your sweet comment dear, means the world to me! aren't skirts the absolute best? can't leave the house without wearing one! I LOVED your purple coat is gorgeous! Both look very cute. I love skirts too. I find skirts so tricky to style too! I love the Topshop one you posted!